Neck injuries that are sustained in sport must be taken very seriously, especially if they are associated with symptoms of concussion or referred pain into the shoulders and arms. When should I see a doctor about my neck pain? Significant trauma to the neck and upper back should always receive urgent medical care. Similarly, those that are associated with severe pain or ongoing impairment following a sporting injury should always be seen by a doctor or healthcare professional. Here we explain the symptoms, which indicate when professional medical advice should be sought. If you experience any of the following symptoms from an upper back or neck injury you should seek professional medical advice from a doctor, physiotherapist, sports therapist, chiropractor or osteopath. Severe neck or upper back pain. Dizziness or a feeling of unsteadiness. Blurred vision or altered vision. Referred pain in the shoulders or arms following a neck or upper back injury, especially if the symptoms do not decrease within 24 hours. “Pins and needles” (paresthesia) feeling or “loss if feeling” (anesthesia) in the arms or hands. A stiff neck is a common complaint which will probably affect everyone at some point in their life. It is, however, usually short-lived, lasting for just a few days at a time. More often than not a stiff neck is caused by muscular tightness. Symptoms include a sudden neck pain with stiffness and restricted movement, especially turning the head to the sides. Some patients may experience a headache or pain which radiates down into the arms or upper back. More often than not a stiff neck is caused a muscle strain in the neck. The muscle tightens up and goes into spasm to protect itself resulting in restricted movement and in some cases temporary neck deformity. Often a stiff neck has an underlying cause such as a build-up of muscle tension from poor posture or work-related repetitive strain. Treatment involves reducing painful symptoms, massage, exercises as well as modifying posture or other underlying causes. Read more on acute wry neck/stiff neck. Whiplash or acceleration/deceleration injury as it is also known as an injury to the neck, caused by a rapid forward and backward motion of the head. This occurs most commonly from a car accident, although can also be sustained through sports involving direct contact or a fall onto the head. The patient will feel stiffness and pain in the neck which may not come on immediately at the time of injury but develop over the following 24 to 48 hours. They will likely have a significantly reduced range of movement in the cervical spine (neck) with headaches, dizziness and blurred vision (this should go within 24 hours if they persist consult your doctor). The pain and stiffness can last for just a few days to a few weeks depending on severity. A cervicogenic headache is a headache which has resulted from a musculoskeletal neck injury or condition. Symptoms are similar to tension headaches and migraine where the patient does not have aura or visual disturbances. If the headache is caused by neck problems then the patient will most likely have restricted movement in the neck, muscle weakness/impairments, and neck joint dysfunction. Often work-related or postural problems can cause muscle tension in the upper back, neck, and shoulder. The muscle tension causes nerve impingement which in turn results in headaches or migraine type symptoms. Cervical nerve injury refers to neck pain which radiates into the arm or may present as just pain in the arm, but the root cause is the neck. The patient may also experience sensory disturbances such as pins and needles and weakness in the upper arm. 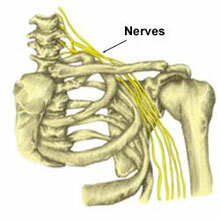 Stingers and burners are also known as a brachial plexus injury. This is a common condition in American Football and other contact sports, caused by nerve compression from impacts to the neck and shoulder area. Symptoms include a stinging or burning sensation which spreads from the shoulder, down the arm, as far as the hand. The sensation usually lasts only seconds or a minute or two although on rare occasions it can be much longer. Stingers and burners are caused by injury to the brachial plexus which is a group of nerves which exit the spinal cord at the base of the neck and pass down into the arm. A burning or electric shock sensation may be felt from the neck to the hand which occurs after compression or a traumatic impact to the neck. Read more on stingers & burners. Thoracic outlet syndrome is a term used to describe the compression of nerves and/or blood vessels which travel from the neck to the armpit (axilla). 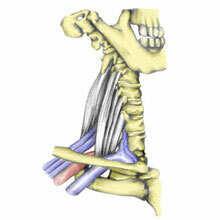 Compression of these structures can cause pain, tingling, numbness, and weakness from the neck and throughout the arm. Read more on Thoracic outlet syndrome. Scheuermann’s Disease is a hereditary disease that mainly affects growing boys between the ages of 13 and 16 years. It is the most common postural abnormality of the spine in young athletes. Children complain of acute pain in the upper back and in later years the upper spine (thoracic) may become hunched or rounded. Read more on Scheuermann’s Disease. Mercer S, Bogduk N. Intra-articular inclusions of the cervical synovial joints. Br J Rheumatol 1993;32:705–10. Roche CJ, O’Malley M, Dorgan JC et al. A pictorial review of atlantoaxial rotatory fixation: key points for the radiologist. Clin Radiol 2001;56(12):947–58. Sobolewski BA, Mittiga MR, Reed JL. Atlantoaxial rotary subluxation after minor trauma. Pediatr Emerg Care 2008;24(12):852–6.